Surface treatment involves the application of a wide spectrum of bituminous emulsions. Each has a specific purpose and outcome. This could be road waterproofing, joining vertical sections of asphalt, pothole repair, and more. BituChem are surface treatment experts, manufacturing a full range of specialist products for the preservation of roads, highways, pavements, cycle paths, and car parks. Millions of pedestrians, motorists, and cyclists travel around the intricate network of pathways and carriageways of our towns and cities. This vital infrastructure is the basis of our commute to work and school. The system enables the distribution of goods to our shops. It is a platform for our journeys to visit family and friends, when we go on holiday, and how we travel to our recreational activities. These surfaces and this infrastructure is an essential part of everyone’s daily lives. Keeping it all in the best possible condition requires a continuous surface treatment programme. We are here to supply the materials required by local authorities and their contractors to meet the challenges of preserving our road network. BituChem has the surface treatment products and expertise to arrest the degradation of paths and road surfaces. In prolonging the lifespan of asphalt and macadam, major repair work can be avoided and disruption is minimised. Both the organisations responsible for our road networks and the road users save money in the long term. In a world of increased traffic and climate change our carriageways are undergoing more strain than ever. 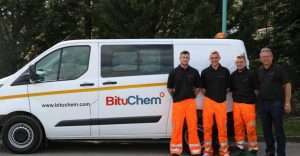 BituChem make and supply surface treatment for both large scale resurfacing, surface dressing or localised road repairs. Apart from the manufacture and provision of surfacing materials, you can hire the BituChem contracting team to install the surface treatment to your highway project. Contact us for further information about any of our products or to hire our contracting team.